Emergency replacement of a water heater that was leaking all over my floors. He was the only one who actually picked up the phone on New Year’s weekend. I am so grateful. I found a plumber who not only removed the old leaky water heater and replaced it with an efficient new model, but also hooked me up with a restoration company that same day. If a friend asked for a referral, what would you say about this contractor? Walter was amazing … not to mention conscientious, polite, hardworking, and honest. “What a way to start the new year!” was my first reaction. Very early on the morning of January 2nd, when I woke up and came downstairs to feed the cat, a strange sound could be heard … which turned out to be coming from my dying water heater. It had leaked all over the carpeting on the first floor – in a den, in a closet, another closet, and even into the garage. Help! I got a list of local plumbers from an online contractor referral service and began calling around desperately. A lot of places were closed for the New Year weekend, so all I could do was leave messages. At Zuniga's Plumbing, though, Walter the plumber answered the phone right away. He was working that day AND he knew a water heater warehouse that was also open, so he told me, “Take a picture of your water heater and text it to me.” He found a new replacement, a 50-gallon Bradford-White Defender, and came right out to install it. I had one more request for him. “I don’t want to get mold from the wet carpeting. Do you help with that?” He replied, “I’ll hook you up with a restoration company I know.” I was very, very fortunate that he was available that day -- and the other companies too. 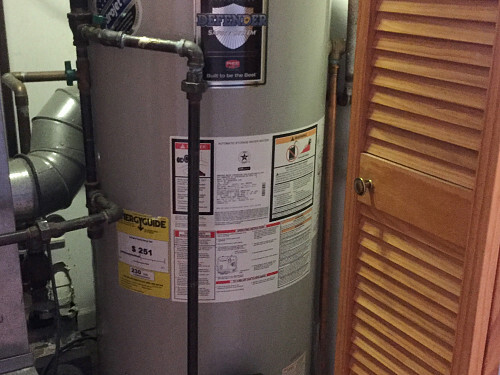 The old water heater was 13 years old. Out of curiosity, I googled “How long are water heaters supposed to last?” and received an answer, “8-10 years,” so I guess I was also pretty lucky that I got a few extra years out of the water heater. If someone asked me for a reference for him, I would say that Walter was amazing … not to mention conscientious, polite, hardworking, and honest. I can’t tell you how grateful I am that he picked up the phone when a lot of places were closed. The whole process was wonderful. I just feel so lucky at how smoothly it went. I was extremely happy with my experience. I am so grateful to companies like Networx because I didn’t know who to call. And that’s how I got in touch with these people who helped me. In an emergency, contact a contractor referral service. It’s a fast way to get the names of reliable contractors. Check your water heater regularly. And if you need to hire a contractor in a hurry, look for pros that have been pre-screened. Awesome Flooring Replacement After The Wood Literally Rotted Away by Barbara C.